Check out the new “Commissions” tab on our site. We’ve added info about how to cop yourself a brand new terrarium if you can’t come to one of our street-side stands! Email us at succulentsisters@gmail.com with any questions. SCRAP featured our terrariums at their annual group show, which was held this year at the Arc gallery in SOMA. The terrariums were on display, but were not for sale in the show. Terrariums and artwork in the show will be on display till January 9! Now welcoming registrations for TOTALLY TERRIFIC TERRARIUMS — our latest workshop! 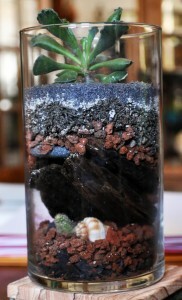 We will sell our terrariums at booth #76 this Sunday at the Alemany Flea Market, from 10 am to 2 pm. The market is at 100 Alemany Boulevard in San Francisco. We have a broad selection of terrariums available, ranging from two-inch-tall vials containing mini cactus balls and airplants to huge fishbowl-style vessels with an assortment of succulents from the genus Echeveria. 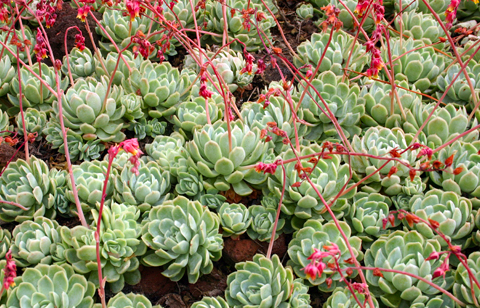 Above: our most commonly-used species of Echeveria. Good news — Flora Grubb nursery in the Bayview is sponsoring our upcoming terrarium workshop at SCRAP! Sign up soon on SCRAP’s website, and we’ll see you on the 28th! We’ll be teaching a class at SCRAP on Saturday, July 28th, from 1-4. Click here to read a description of our workshop on SCRAP’s website. Click here for SCRAP’s website. Join us for an afternoon of terrarium-making!